Ask The Experts: Are you sabotaging your relationships? We Recommend: I Need Your Love - Is That True? 3 weeks into a fun, mutually rewarding relationship. Why is he suddenly backing away? Were so glad you asked this question, because it demonstrates a key point in the process of creating lasting and fulfilling relationships: the importance of asking the right questions. How can you build rewarding relationships and attract abundance at the same time? We've been asking ourselves this question for years, and we finally found the answer! 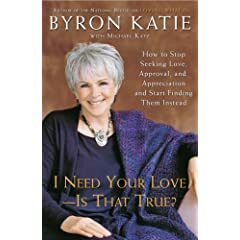 We absolutely love Byron Katie's work. She is one of the wisest, clearest and most compassionate teachers we've ever known. The subtitle of the book says it all: How to Stop Seeking Love, Approval, and Appreciation and Start Finding Them Instead.